On October 16, 2018, Walt Disney World in Florida changed its ticket pricing scheme. Now all park tickets are priced based on when the tickets are going to be used. Walt Disney World started with date-based ticket pricing in February 2016 with 1-day tickets. With all the different combinations and options, there are now 4,338 differently priced tickets. Don’t worry: Disney has made a website to purchase your tickets in three steps, and Brian posted a YouTube video of the process. For this post, I’m only going to look at Adult 1 Park Per Day Tickets. Child tickets are a bit less expensive, and ticket add-ons (Park Hopper, additional days, etc.) will obviously increase the price. However, prices of this adult ticket correlate with prices for other ticket options, so our analysis is relevant no matter what tickets you plan to buy. Looking at 1- to 10-day Adult 1 Park Per Day Tickets, there are only 723 price combinations. All prices in the analysis are before sales tax. The last Walt Disney World ticket increase was only 8 months ago on February 11, 2018. The table below shows the price changes compared to Disney World’s 2017 prices. Disney announced that some ticket prices went down with the new pricing scheme. This is true relative to the prices in effect just prior to the October 16 price changes (i.e., those in effect from February 11 to October 15, 2018). For the rest of this post, all price change comparisons are relative to prices as they were on October 15, 2018. Starting on October 16, 2018, 1-day tickets have four different price points: $109, $114, $122, and $129. The old 1-day ticket prices were $109, $119, and $129 (Value, Regular, and Peak seasons, respectively) for the Magic Kingdom. For the other three parks, the old 1-day ticket prices were $102, $114, and $122. Disney has changed 1-day ticket pricing to be the same for all parks. 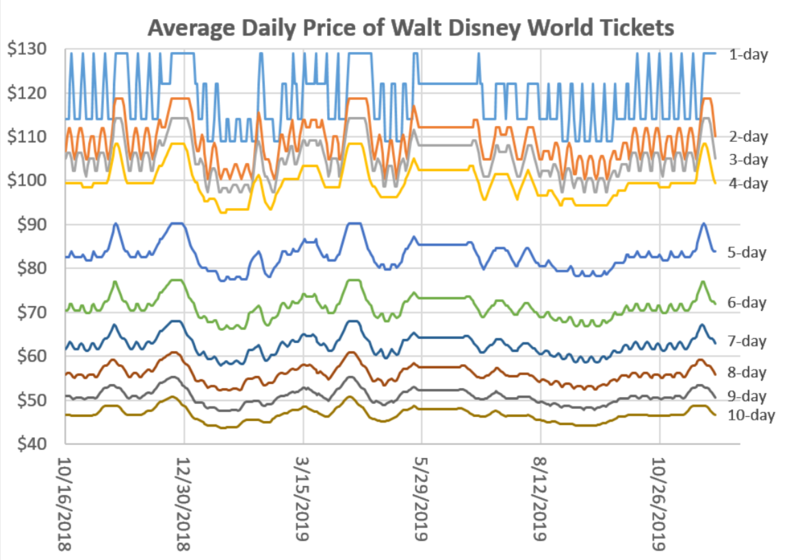 The average price of 1-day tickets did not change for the Magic Kingdom but went up $6 or 6% for Epcot, Disney’s Hollywood Studios, and Disney’s Animal Kingdom. 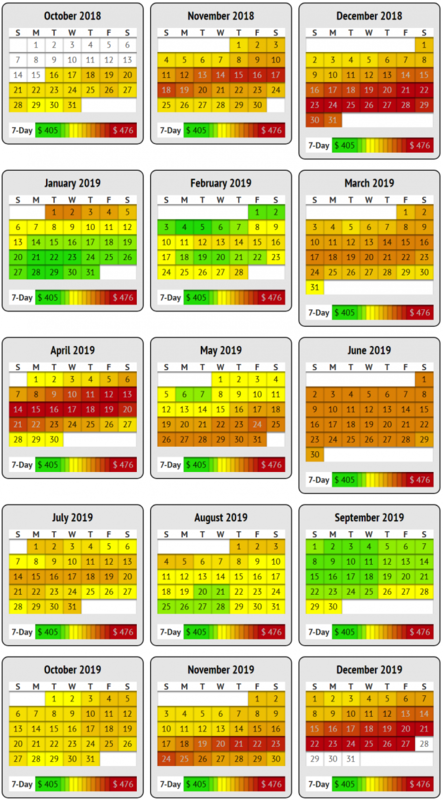 Multi-day ticket prices are based on the average 1-day ticket prices for which the multi-day tickets are valid, minus a discount for the number of days on the multi-day ticket. Let’s take a look at some examples of how to compute the price of multi-day tickets. A 5-day ticket starting on June 10, 2019, is valid from June 10-17. The average price of a 1-day ticket for the eight days is $122. With the 30% discount, the average daily price is $85.40, and the total price is $427. A 4-day ticket starting on January 22, 2019, is valid from January 22-28 (seven days). The average price of a 1-day ticket for those seven days is $114.14 ((114+114+114+109+109+109+109) ÷ 7). With the 16% discount, the average daily price is $92.76, and the total price is $371.04. 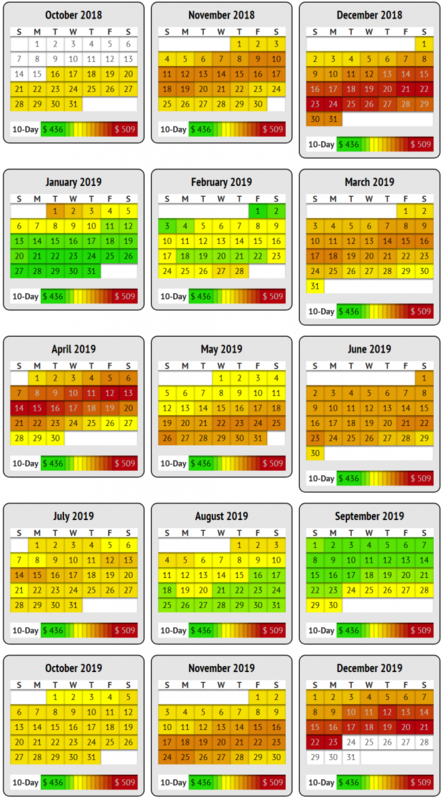 The chart shows how the length of tickets reduces the average daily price. The chart also shows the variation in pricing is reduced the longer the tickets are valid. Knowing how Disney is calculating ticket prices, you can look at the 1-day ticket prices and see if adjusting your ticket start day would save you money. A ticket starting on January 21 is going to be cheaper than a ticket that starts on January 20. And a ticket starting on January 22 will be cheaper than tickets starting on January 20 or 21. In all, 89% of the multi-day tickets price increased. The average increase is 5.7%, with the most extreme cases going up 15%. The largest increases are during Spring Break, Thanksgiving, Christmas, and around New Year’s Eve. With all the ticket prices released, 11% of the tickets are cheaper now than prior to the October 16, 2018 change. The average savings is 1.4%. There are very few tickets that are cheaper than they were prior to Disney’s first set of 2018 price changes (on February 11). January 22, 2019, has the best price for any length ticket. January 21, 23, and 28 also have some of the lowest prices. Other dates that have lower prices are in January, February, August, and September. There are also a few days outside these four months where you can find 2-day and 3-day tickets where the prices decreased. What’s after December 16, 2019? When Disney released the new ticket prices, the new prices stopped on December 16, 2019. Some assumed this was a sign that Galaxy’s Edge (Star Wars Land) at Hollywood Studios will not open before December 16, 2019. I don’t think this is why. 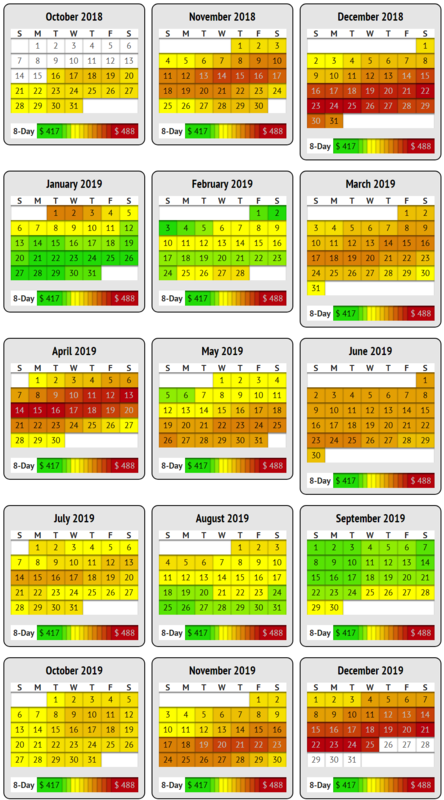 In the past when Disney updated its web-based calendar that showed the “season” of 1-day tickets, that calendar ended in mid-December, so this is not something new. I expect Disney will add 2-3 months of pricing at a time and will raise the 1-day prices $1-2. The date-based ticket pricing allows Disney to gradually increase prices without having to make a big announcement, perhaps reducing the public outrage that comes with a price increase. Knowing the formula Disney is using to compute multi-day ticket prices, we can determine how Disney has valued December 17-28, 2019. And since it is the busiest time of year, we also can assume that the five days after that (December 29, 2019, to January 2, 2020) will have peak pricing. The calendars below show prices beyond December 16, 2019, using assumed values for December 17, 2019, to January 2, 2020. We ran a quick Twitter poll asking whether families will move their Disney vacation to cheaper dates. 16% of those who responded said they would; another 30% said they would think about it. Moving dates definitely makes sense for some families. The cost of 3- to 6-day adult ticket – the most common tickets sold – varies by $51 to $69 throughout the year. Moving dates might save a family of 4 around $200 to $260. However, it’s one thing to say you’ll move dates; it’s another to take your children out of school to save $200. After all, most guest travel dates are driven by work and school schedules. Also, lodging and travel costs have been date-based for years and people still travel during peak season. Most people travel when it is convenient, despite the cost. That won’t change. If the true purpose of Disney’s date-based pricing is to evenly distribute crowds, Disney should do two things: First, make the difference in prices more dramatic, either by increasing prices during peak periods, or reducing prices during slower times. Second, Disney should provide refunds to guests who purchased tickets for higher-cost dates and then moved to lower-cost dates. Right now, Disney doesn’t provide this refund. That eliminates the incentive for families who’ve bought higher-crowd tickets to move to slower times of the year. We don’t think the price hikes are done. Over the last few years, Disney has announced ticket price increases in February. We expect another price hike in February 2019. 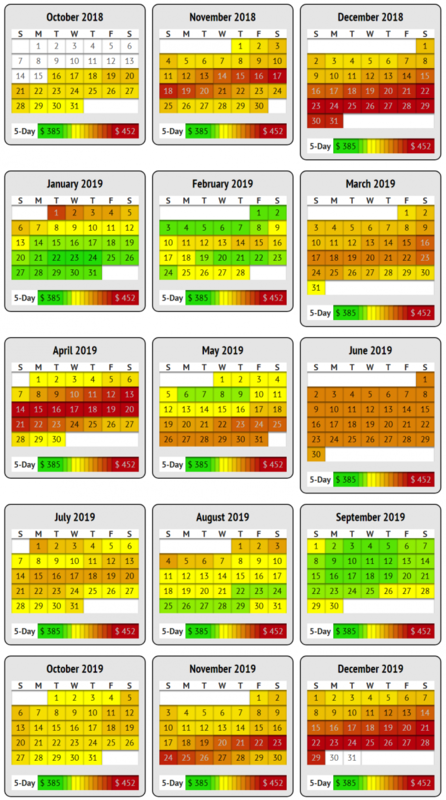 Also, it’s no accident that Disney’s new ticket calendar shows prices through December 16, 2019. Disney’s much-hyped new Galaxy’s Edge land is supposed to open in “Late Fall 2019”, and fall ends on Saturday, December 21, 2019 – right before the traditionally busiest week of the year at Walt Disney World. We’re pretty sure that Disney intentionally didn’t display ticket prices for when Galaxy’s Edge will open, because that will include another price hike. 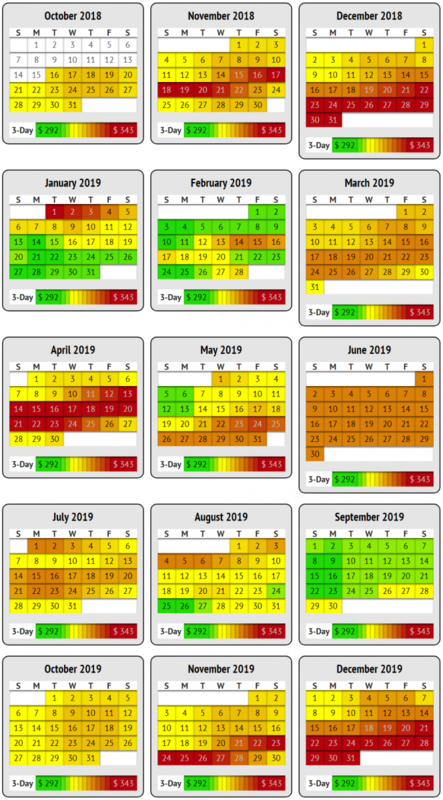 That is, we think there will be at least two more ticket price increases between today and when Galaxy’s Edge opens in 2019. 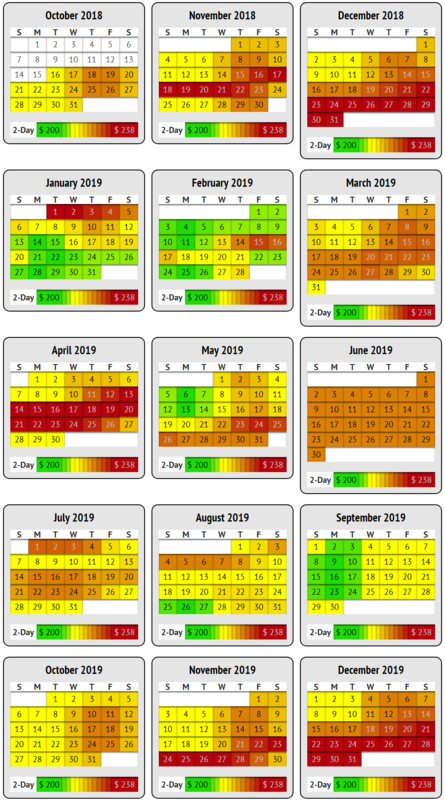 We also wouldn’t be surprised to see Hollywood Studios get its own separate “surge pricing” calendar when Galaxy’s Edge opens. If Disney truly wants to distribute crowds evenly, it won’t make sense to charge the same for Hollywood Studios with its new, cutting-edge Galaxy’s Edge land, as for Epcot, a park desperately waiting for updated and new attractions. Have any comments or questions about the new pricing system? Let us know below. 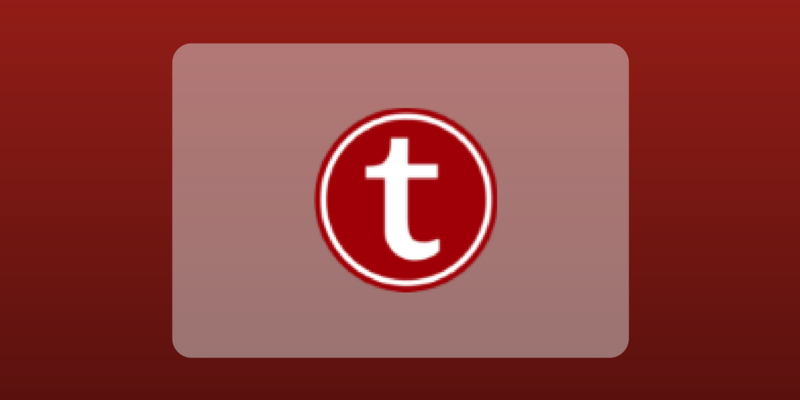 By helping TouringPlans.com continue to reach the most accurate crowd level predictions, Steve finally found a way to meld his training in statistical analysis with a lifelong passion for Disney. He first visited the Magic Kingdom in 1972, just a few months after it opened. Now he enjoys frequent trips with his two kids. At age four his son insisted on wearing cowboy boots to reach the height requirement for Test Track, and his daughter believes that a smoked turkey leg and Dole Whip make a perfectly balanced meal. Even though she doesn't quite get it, Steve's wife is supportive of his Disney activities. If you already have tickets purchased for next year, are you grandfathered in or will they be altering the prices on my reservation? Thanks to Steve and team for this analysis. 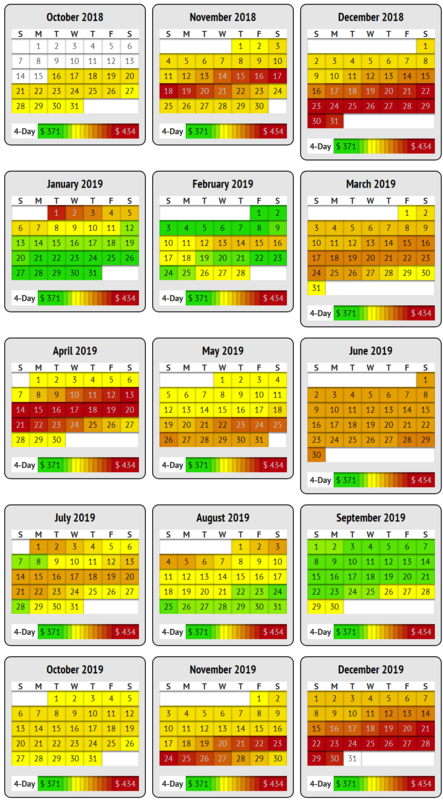 The ultimate question for me is how this new system will affect the availability and pricing of discounted tickets through places like UndercoverTourist. For people who only buy direct through Disney the analysis above would be very helpful, but taking away discounted ticket options (if they do) means far more to my budget than a change in the retail price. 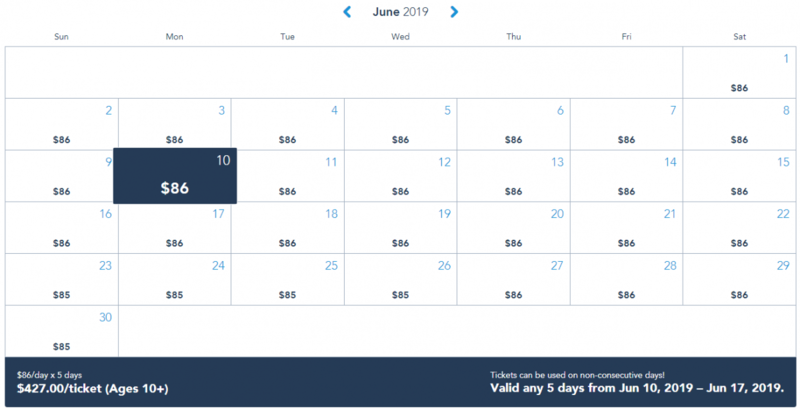 We have no reason to believe that Disney has stopped working with authorized ticket resellers, and it is likely that you’ll see resellers offering these “new” date-specific Disney World tickets by the end of this month. In the meantime, some vendors continue to sell the “old” tickets. Others have stopped selling tickets while they transition to new offerings. Even if you buy from an authorized reseller, though, this post’s analysis may be of interest: the discounted prices will likely track Disney’s prices in some way. Thanks for the deep-dive Steve (and team)! Who else would put in the effort to crack the code of how these prices are being generated, AND post that analysis for all to see free of charge? This is exactly why my touringplans membership is a no-brainer. I know it’s outside the scope of the article, but did you determine how park hopper upgrades are priced now? Is it a fixed amount based on length of ticket? A multiplier on the base ticket cost? Your suggestion at the end, that Disney should offer refunds for people who exchange already-bought tickets for cheaper ones, is an interesting one. The old system wouldn’t give you a refund to downgrade a 6-day ticket to a 4-day, and obviously the new one never will either. It would also be surprising to see Disney issuing outright cash refunds. However, what about “store credit” (as it were)? If a family buys 5-day tickets for December, and then has second thoughts and wants to move to November, they could offer them a Disney gift card or resort account credit for the difference. The family doesn’t get their money back, but they also don’t “lose” anything by using their tickets in a lower tier season. 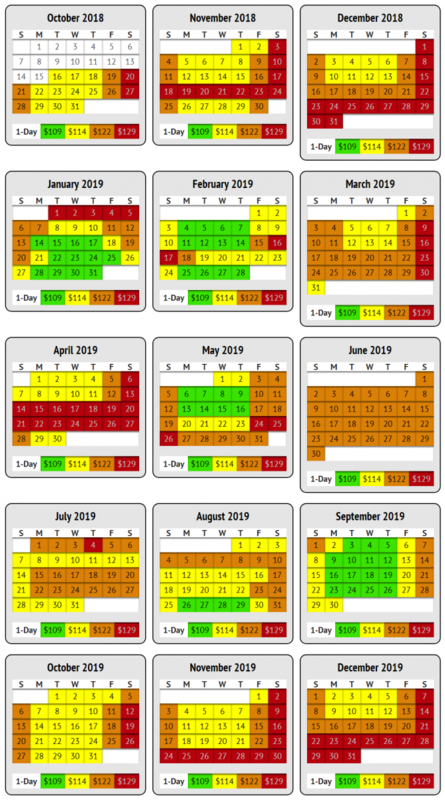 As before the October 16 changes, adding on the Park Hopper or Park Hopper Plus options costs a fixed amount more than a 1 Park Per Day Ticket. These add-on costs vary by ticket length but NOT by date. Another way to say this is that the difference in price between a 5-day Park Hopper Ticket and a 5-day 1 Park Per Day ticket is the same ($75 plus tax) on December 31 as it is on August 31. Park Hopper Plus costs an additional $25 on top of the Park Hopper upgrade. This new pricing system is clunky, confusing, and too clever by half. If not part of a package, you can purchase your park tickets for a different start date. Your FastPass+ window is based on your check-in date, regardless of the type of ticket you have.